Cabbage is a quintessential part of Irish cuisine, along with bacon and potatoes. Tenant farmers in the 17th century were forced to pay substantial rents to their landlords and relied heavily on their crops of nutrient-dense cabbage and calorie-dense potatoes, both hardy vegetables, to get them through the year, especially in the winter. The more prosperous farmers also grew pigs, so were able to season their vegetables with the parts that weren’t needed to pay off their monthly tariff. When the Great Potato Famine hit Ireland in 1845, eradicating much of the country’s potato crop, cabbage became even more critical as a food source. On St. Patrick’s Day, it’s quite customary to eat cabbage in some form. It remains one of the most affordable and durable vegetables around, a reliable source of something green in the colder months, and when paired with its old compatriot bacon, it may be humble but it’s delicious. Sometimes the simplest dishes are the most memorable. Here the bacon is crisped up in a heavy large pot, and then some onions are quickly sautéed in a bit of the remaining pork fat. 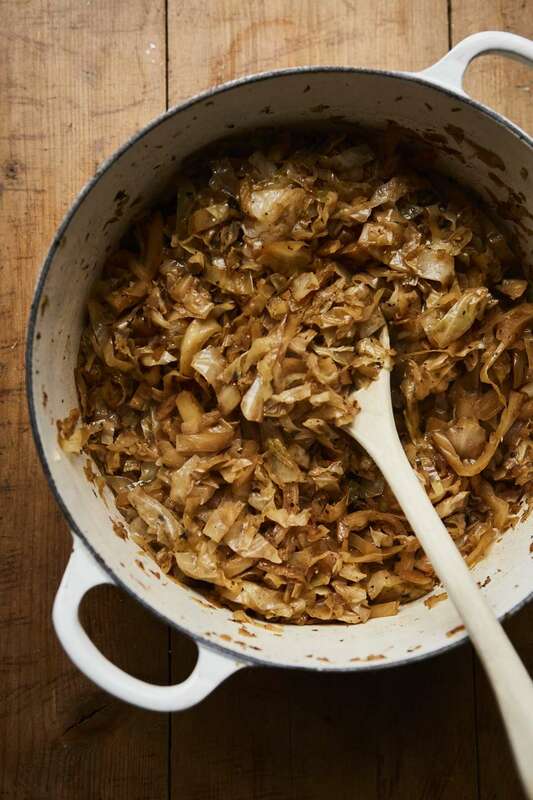 Then the cabbage is added, along with the beer of your choice, and in 30 minutes you have a dish that may be modest in cost and appearance, but quite grand in flavor. This would go very well with corned beef, but also with roast chicken, salmon, a steak, pretty much anything. Heat a large heavy pot or Dutch oven over medium heat and cook the bacon until crisp, turning as needed, 5 to 6 minutes in all. Remove to a plate lined with paper towels. Pour off all but a tablespoon of the fat from the pan, and return to medium heat. Add the onion and sauté for 5 minutes, until golden brown. Add the cabbage and toss occasionally in the pot for 3 or 4 minutes until the cabbage begins to wilt and is well mixed with the onions. Pour in the beer and bring to a simmer over medium-high heat. Partially cover the pot, lower the heat to medium-low, and simmer for about 30 minutes, stirring occasionally, until the cabbage is tender and most of the liquid is evaporated. Crumble the reserved bacon and stir it into the cabbage. Serve hot or warm.